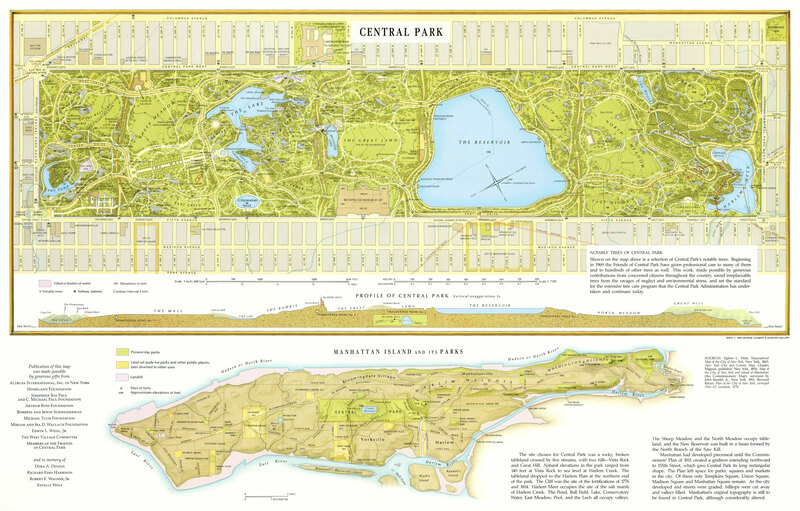 In the center of Manhattan Island, Central Park takes up 843 glorious acres of naturalistic landscape. As summer humidity sets in, the park’s naturalistic waterways are a good place to rest: The Pond, The Lake, Turtle Pond, The Reservoir, The Pool and Harlem Meer. There is also the un-naturalistic Lasker Pool for swimming. Prior to 1936, there was an additional body of water in the park that is not there today, Ladies’ Pond. To find it, one would enter Central Park through Naturalist’s Gate at West 77th Street, turn right until the street merges with West Drive and enter a small field amid the trees. Prior to the development of Central Park, a stream called Saw Kill flowed through the site. It flowed east through a valley that would later be filled with The Lake, continuing to the Upper East Side, where it flowed into East River at East 74th Street. Saw Kill received its name from the Dutch, who sent their African slaves to the Upper East Side to cut lumber along the creek. The 1994 map by George Colbert and Guenther Vollath (a piece of which is shown above) recreates the stream’s path in relation to the park’s present waterways. In 1857, the creek was covered and sections of its course were flooded with water from the city’s aqueduct for Ladies’ Pond, The Lake and Conservatory Water. Taking place at a time of enforced public modesty, Ladies’ Pond enabled single women to skate freely without being approached by men. At the time, Eaglevale Arch, which carries West 77th Street, spanned the pond. Artist Winslow Homer visited the pond on assignment for Harper’s Weekly magazine. Following the draining of Ladies’ Pond in 1930, a small section was transformed into a brook, reminiscent of Saw Kill. Pipes hidden between rocks give the appearance of water seeping out of the ground as if this were a natural spring. A rustic bridge over this brook, like many benches, paths, water fountains and trees, carries a small plaque with the name of the park’s private supporters. In this case, we have Triplets Bridge, dedicated in 2000 in honor of Benjamin, Rachel and Justin Chasalow. Curious about the namesakes, I conducted a brief online search. Their father Michael Chasalow is a corporate attorney and professor atUSC Gould School. Mother Emily Chasalow is also an attorney, raised in New York. They reside in Los Angeles. Beyond this rustic bridge, the brook descends further into a ravine hidden by Balcony Bridge, which carries West Drive over the water. On the other side of Balcony Bridge, the brook empties into The Lake. Why exactly is it called Ladies’ Pond?